You can listen to all songs of Heart thief here. That's what I did after reading Erwin Zijleman's blog 'De krenten uit de pop' this week and decided to pull out the old credit card straight away. It's a rare thing when I'm truly touched by a voice, usually it's the music that is responsible for that. Stephanie Fagan's slightly raspy voice made rather an impression and as I also liked the songs I was hearing, the combination was a winning one. Stephanie Fagan comes from the U.S.'s south. South Carolina to be precise. After playing a lot while travelling around she released her first album in 2009, 'Ideas for your ear bone'. In 2011 this album, her second, was released through an independent label. She now lives in Germany. So who gets her to the Q-Bus in Leiden? Country and singer-songwriter are musical forms that do not have a lot of mysteries to Ms Fagan. Even when she goes deeper into country territory she manages to keep me on board, where others would have forced me to call it quits. The main difference is that she stays true to herself and is not looking for emotional effects of the dubious kind. She lets her voice sort of fade, instead of putting emotional power behind it. The effect is just right. This also goes for the way a lazy piano, mandolin or banjo drives several songs. It's a treat to listen to. No antics, just slow rhythms, with 'Beautiful man' shining out brightest. Everything is spiced up every once in a while by a clean sounding electric or a slide guitar. The accusing 'You are the devil' has both guitar and banjo. These changes between the lead instruments give songs a distinct individual flavour, that make Heart thief very attractive as a whole album. The album goes wide with an almost jazzy 'Blow', a delightful slow song, with spacious piano notes, a muted trumpet and Stephanie's voice, all the way to the slide blues 'Prodigal', where she gets the right effect. 'Paris, Texas' with a female voice. Next to the already mentioned country song 'The diner song ', there's several easy listening songs, that are just plain good. And a roots rocker to boot, 'Boy who doesn't exist'. She gets away with all styles and songs, with not so much a confident voice, but a modestly exposed knowledge that gives each style exactly the voice it needs. As I only have the digital version of the album, I can't say anything about who plays what, just that the production of Missy Davis Jones serves Stephanie Fagan in all the right places. Subtle accompaniments, a soft male voice behind her own. A rocking guitar to lively things up or spaces to let the music breathe and Stephanie Fagan shine. The sound is clean and bright, just like her voice in most songs. The long range of influences go all the way from Joni Mitchell and Carol King to Ry Cooder and James Taylor and there are even songs that could have been sung, in three voiced harmony, by Girlyman. Looking at the pictures on her website there is a lot of Stephanie Fagan, but she also offers a lot on Heart thief. This album deserves to be heard by a lot of people. 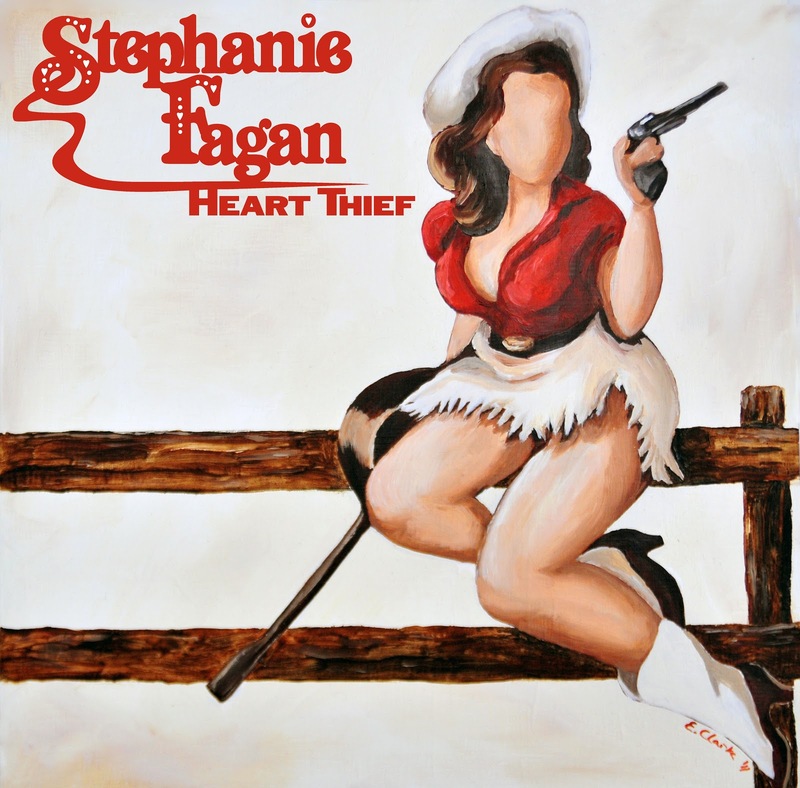 If you're interested in music that walks that thin line between, folk, country, singer songwriter, roots rock and blues and like a good female voice with a tough edge at times, Heart thief by Stephanie Fagan is an album you want to check out. For $10,- or €8,66 it's all yours if you go to her Bandcamp site. It's a bargain! You can order Heart thief here.